No out actors were nominated — but Armie Hammer, Timothée Chalamet, and Emma Stone were honored for playing gay roles. Another year, another awards season absent of out nominated actors. The Golden Globes unveiled its nominees Monday, and the list is almost entirely devoid of queer people. Not counting producers, the sole exceptions are in Best Original Song: Justin Tranter ("Home" in Ferdinand) and Benj Pasek ("This Is Me" in The Greatest Showman). However, in the awards ceremony — a bellwether for the Academy Awards — several straight actors are nominated for playing gay roles. In the film categories, these include Armie Hammer (Actor in a Supporting Role - Call Me by Your Name), Timothée Chalamet (Actor in a Motion Picture, Drama - Call Me by Your Name), and Emma Stone (Actress in a Motion Picture, Comedy - Battle of the Sexes). In television, Eric McCormack also nabbed a nomination for his role as Will in NBC's revived Will & Grace. 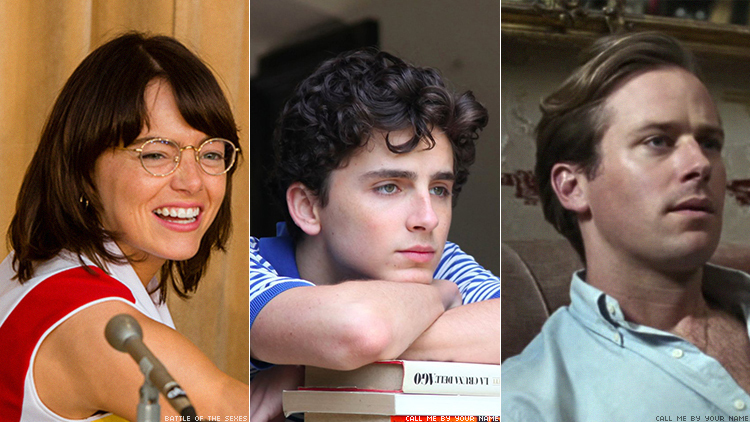 These actors all delivered awards-worthy performances: Chalamet as a teenager experiencing first love and heartbreak, Hammer as his lover, and Stone as the tennis legend Billie Jean King, who helped topple the patriarchy in a match against chauvinist Bobby Riggs. However, their nominations are also the latest in a decades-long tradition of straight actors portraying LGBT roles for awards bait. Over 50 straight (or closeted) actors have been nominated at the Academy Awards for queer performances — but an out actor has never won Hollywood's highest honor. In November, Hammer received criticism from a BuzzFeed writer, who viewed his repeated casting in blockbusters and independent films as problematic and symptomatic of bias in Hollywood. "No one gets second chances in Hollywood the way straight white men do," wrote Anne Helen Petersen. She pointed to the public relations move of "indie martyrdom," in which actors play role against type (straight actor playing gay, for example), as "what faltering stars do to restart their careers or the narratives about them." Meanwhile, there is still an abysmal lack of LGBT representation in major motion pictures, reports GLAAD. And Hollywood has yet to overcome real perceptions of bias in its casting of out actors. Call Me by Your Name also has a gay director (Luca Guadagnino) and screenwriter (James Ivory), who were not nominated by the Golden Globes. However, the film has several queer producers, including Guadagnino and Ivory, who would take home gold if the film wins Best Motion Picture, Drama. The winners will be voted on by the Hollywood Foreign Press Association. Interestingly, a gay actor who was not honored made news. Throwing serious shade, the Golden Globes nominated Christopher Plummer (Best Actor in a Supporting Role) for All the Money in the World. At the eleventh hour, Plummer replaced Kevin Spacey in the Ridley Scott film by reshooting his scenes, following dozens of accusations of sexual misconduct on Spacey's part.